Classic holiday bliss within easy reach of Lugano city! Providing an authentic getaway on the beautiful Lake Lugnao, this hillside apartment offers a year-round getaway for groups and families of 4. 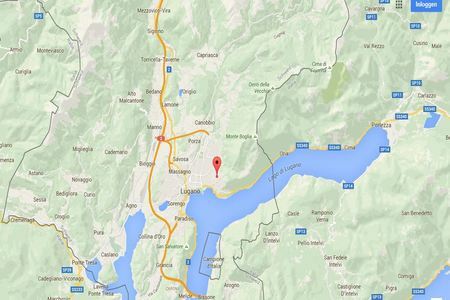 Situated within enviable reach of Lugano city centre, guests can truly soak up a holiday to suit all tastes. Its tranquil and timeless surroundings are perfectly reflected within the inviting interior of the ground floor apartment. Here guests can relax and easily feel at home within the classic homely interior. A lake view sitting room furnished with a comfortable sofa, SAT TV, DVD player and WIFI access offer all the modern age must-haves, whilst the separate dining area for 6 perfectly captures the romance and history of the region, with rustic-style charm conjured up by brass pots and pans, a large hearth and a feature beamed ceiling. Adjoining the spacious dining area, a separate kitchen is fully-fitted for carefree meals in. All the must-have appliances are provided including an electric hob, oven, electric kettle, coffee machine and dishwasher. From the spacious and inviting living and dining areas, French doors lead out to an inviting covered lake view terrace. Furnished with a round dining table for 4, the scene is set for enjoyable summertime feasts and alfresco evening drinks. The sunny private garden offers a tranquil haven in which guests can soak up some and sun and leave all their cares behind. 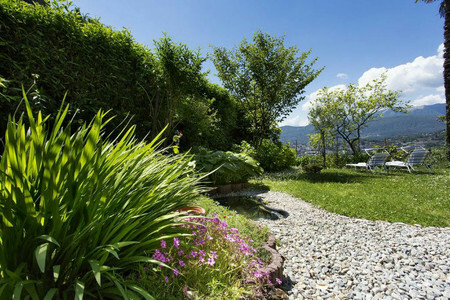 With mature planting, sun beds and the far reaching lake views over Lugano city for company, the magical hilltop surroundings of the garden provide magical escapism in all seasons. The apartment’s sleeping accommodation is ideal for friends and flexible family stays, with 1 sleek and contemporary lake view double bedroom with mirrored fitted wardrobe, 1 lake view twin bedroom and 1 double sofa bed to the inviting living room. A family bathroom fitted with a bath tub and overhead shower completes the internal layout of the apartment, whilst private laundry facilities and parking are also to hand. 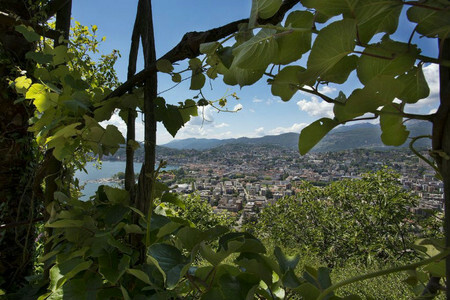 From the sun soaked hillside, the cosmopolitan delights of Lugano city centre are just a 9 minute drive away. Here guests will find a wealth of restaurants, cafes, supermarkets and transport amenities to hand. The fashionable Swiss lake capital also boasts a wide array of high-end fashion boutiques, antique shops and cultural events to savour throughout the year. As well as idyllic lakefront walls, parks, art galleries and boat trips, guests can also enjoy an evening out here, with chic bars and nightclubs to dance the night away at, alongside fine dining and classic Swiss casinos to take a bet on. 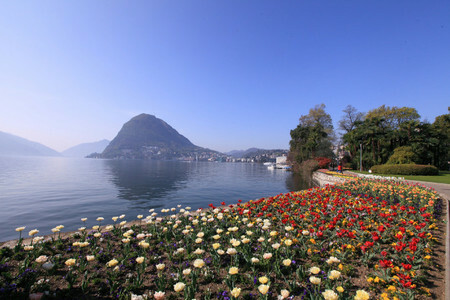 As well swimming, lidos, hiking, water sports and more, Lugano is perfectly situated for reaching the cultural allure of historical Bellinzona (28 minutes drive), the family-friendly outdoor leisure activities on Monte Tamaro (68 minutes drive) and the romantic appeal of timeless Lake Como (50 minutes drive away). Nette ältere Wohnung mit schönem Blick. Küche ist gut ausgestattet. Busanbindung ist gut. Heizung funktionierte leider nicht richtig. Gut war der Spieleschrank. Ein Stadtplan bei den Infomaterialien wäre schön gewesen. " Liane Rothenberger "
October 2017 Wir verbrachten wunderbare Tage in dieser Wohnung. Die Aussicht über Lugano war sensationell und der Sitzplatz auf der Veranda gemütlich. 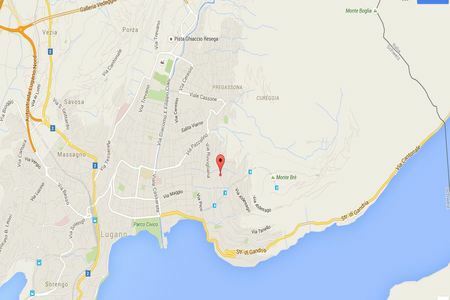 Mit dem Taxi ist man erheblich schneller beim Haus als mit öV. Wir würden aber auf jeden Fall wieder kommen! Basil, Germany " Basil Hotz "
Sandra, UK Good for family of 4. Quite a way away from city centre but funicular and bus available. Bus does not run all hours of the day, check this. October 2017 " Sandra Morandi "
October 2016 Wonderful spot overlooking Lugano. Quiet neighborhood with great views!! Douglas, UK " Douglas McCracken "
July 2016 It was just as the photos promised. The most impressive is the breathtaking view of the city, the lake and the mountains. The apartment is quiet and well equipped. The information for the trip were perfect and everything worked out very well. Annamarie, Germany " Annamarie Floton "
Uns hat der Aufenthalt sehr gefallen. Die Aussicht ist fantastisch, Lugano und der See wunderschön und die Wohnung groß und charmant. Man kann im Garten auf Liegen sitzen und auf der Terrasse mit Blick auf die Stadt dinieren. Es gibt zudem schnelles WLAN und eine moderne Küche. Rundum empfehlenswert. " 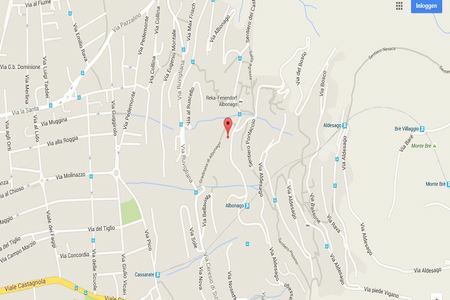 Gast "
Daniel was great with communication and was very accommodating! Although he wasn't the host he was a great liason and answered all my questions in a very timely manner. Thanks for a great stay :) " Taimur "